We rocked up to the Olive Tree Taverna in Arsenal on another hot and sticky day last week after failing to find a Kenyan restaurant we had heard about around these parts. This turned out to be a happy turn of events in the end though, the Olive Tree being a delightful family run place which fed us very well! As it was a very warm day we made the most of the restaurant’s small outdoor seating area, which though it didn’t have the best view of Arsenal (if such a thing exists) it did mean we could eavesdrop on the pub quiz happening across the road. We went for the special dinner offer of 3 courses for £10.90 which turned out to be great value for money, both of us going for Dolmades (stuffed vine leaves) to start, which came with some lovely tsakstiki along with a basket of the best pita bread I’ve ever had, which according to the menu was an old family recipe. 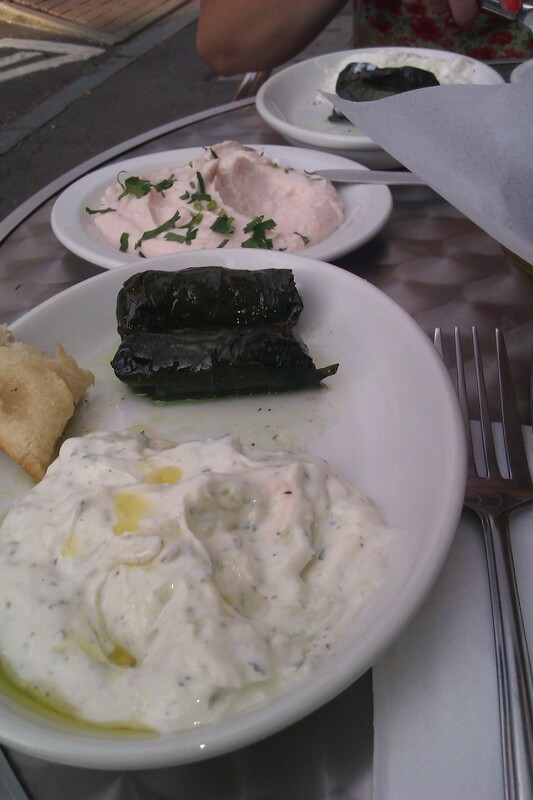 The waitress also brought out some taramasalata with them, saying it was ‘on the house’ – splendid! We properly Greeked out this evening, supping on Cypriot bottled beers (Mythos and Kronos – very refreshing) to go with our mains of calamari and chips and Jodi’s Emam which is potatoes and aubergines in tomato sauce with feta and olives – both were generous and satisfying portions and we were paralysed for a while after eating them. Being even too full to eat our dessert – part of the special offer – we had to coyly ask if they could put the coffee cake in a bag for each of us so we could eat it later. 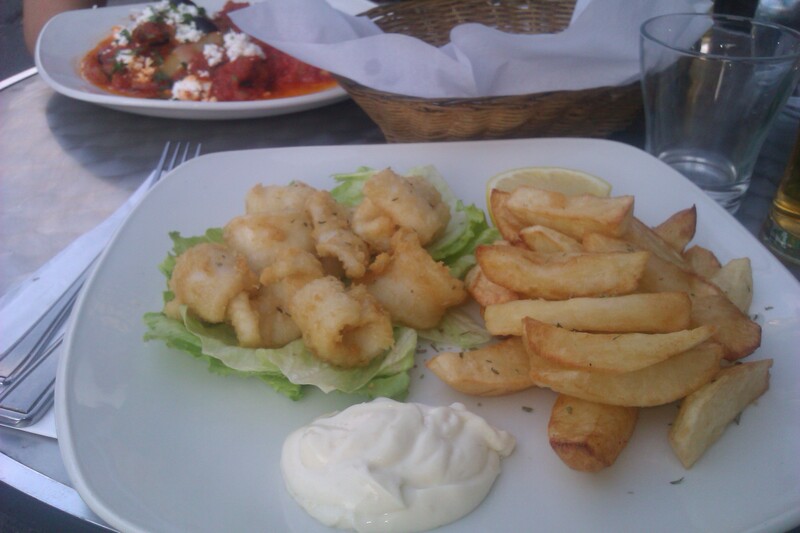 The owner was happy to oblige, super lovely and very helpful, just how I’d imagine a proper Greek mother to be. I enjoyed my cake for breakfast the following day, scrumptious! They were so nice here, they made us feel especially guilty when we didn’t have any change to give them a tip, so if they ever read this, we’re very sorry and we’re rubbish people. We only hope it is busier on other days of the week, we were the only customers the whole time we were there and it definitely deserves more, so do check them out if you can. Jamas! This entry was posted in Uncategorized and tagged arsenal, Dining, dinner, Dinnergeddon, Eating out, Food, greece, greek, London, the olive tree taverna by dinnergeddon. Bookmark the permalink.